Last night, while tucking into my deep fried pig's head in Putney, I found myself asking myself the question "Why do I eat at restaurants?". Not in a despairing, self-pitying way, although God knows those kind of thoughts have crossed my mind during more than a few meals in the past year. No, this turned out to be a very tasty plate of food and I enjoyed it. But more in a philosophical way - the food at the Prince of Wales makes absolutely no pretentions towards haute cuisine; it's straightforward to the point of basic, albeit comfortably seasonal and with some charmingly eccentric ingredients. But many of the dishes were so basic I could have made them myself, and believe me I am no expert cook. In these days of credit crunches, global uncertainty and looming environmental armageddon, is it wrong to pay to eat food you could have made yourself with very little effort? Should I be aiming to make my meals out more of a special occasion than just something to fill a hole of an evening? Fortunately this weakness didn't last long. Of course it's not wrong to pay for simple food occasionally. 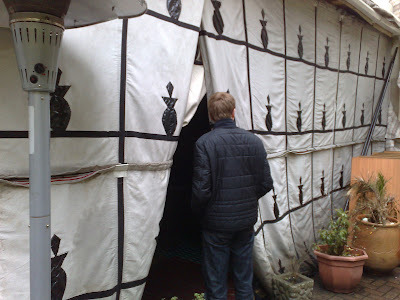 Every mouthful consumed outside my front door doesn't have to be a life-changing gastronomic experience, and I shouldn't have to feel guilty for paying for someone else to cook for me, whether at Gordon Ramsay's or Munchies Kebab shop. And so next time I couldn't be bothered cooking of an evening I will waddle on down to the Fox and Hounds and order their brilliant broad bean risotto with my head held high. Back to earth and back to the Prince of Wales. 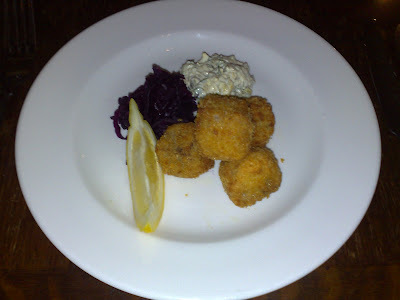 The aforementioned pig's head dish was neat little cubes of breaded pig meat, served with a home made tartare sauce (called Gribiche on the menu) and lovely softly picked red cabbage. Pig's head I've had served in a number of different ways and never know what to expect from one restaurant to the next, and I have to admit on being presented with deep-fried goujons I was worried they may be a bit much. However they were moist without being greasy, and the tartare sauce was a great accompaniment. 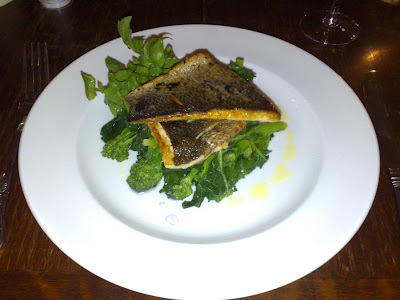 Next up was a couple of smallish fillets of nice fresh seabass on a huge mound of buttery greens. Probably slightly too many greens if I'm going to be picky, but they were good and I told myself you can never have enough of a good thing. And a friend's cheese and potato pie was as good to eat as it was attractive to look at, before she'd torn it apart with a knife and fork that is. The room was prettily decorated and lit and service, seeming to consist of only one very attentive young lady albeit with only a loose grasp of the English language, was as good as you could have hoped for with only 3 tables taken on a quiet Tuesday evening. In fact towards the end of the meal I really had to struggle to find anything at all that wasn't good about the Prince of Wales apart from the worryingly empty room. Even the toilets were clean and new. So, the London gastropub scene rolls on. It's very easy to get blasé about "yet another" good new place but the fact that this opened with such little fanfare shows how mature the restaurant scene is in London. I know I'm only judging from a quiet weekday evening but will even the good places struggle to get bums on seats with so much competition around? Let's hope not. 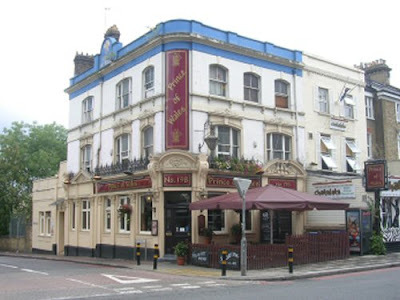 The Prince of Wales deserves to do very well, and I at least will definitely be back. Credit crunch be damned. I don't know how it sounds to you, but I was deeply suspicious the first time I heard the name Mrs. Kirkham's. Like Bernard Matthews or Aunt Bessie's, it sounds like a fictitious name dreamed up by marketing executives to evoke cheerful simple farm folk and organic, hand-made produce, as opposed to the mass-market mechanically-reduced gunge such stuff generally turns out to be. And yes, I know Bernard Matthews was a real person, but you get my point. So imagine my delight when I discoverd that Mrs Kirkham's is pretty much the real deal. Unpasturised milk, small herd, small batches and a genuinely family-owned business that goes back 3 generations, at least if their website is to be believed. All of which would count for naught if the cheese didn't taste any good, but as I can testify since my introduction to it in Liverpool last month, Mrs. Kirkham's is a lovely little cheese. It is distinctly Lancashire with that trademark creamy crumbliness, but it's softer and waxier than your average supermarket variety, so the crumbliness is a pleasant texture rather than just being dry and cloying in the mouth. Also it has a definite pungent note, almost a tang of blue cheese, adding a wonderful depth to the flavour. I imagine that left even longer this cheese would continue to mature and grow in complexity, although I doubt it will get the chance in my house. I bought as big a slab as I could reasonably have got away with without Hamish Johnston thinking I was going into wholesale, and it's already half gone. Still, if you get a chance, see if you can get a hold of some Mrs Kirkham's. 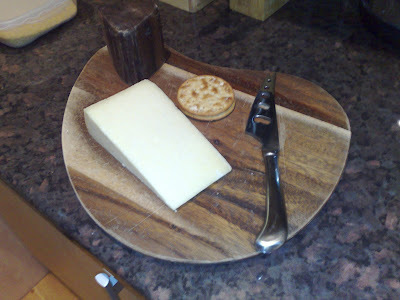 It's not as scary as some I've tried on this blog before, but it has enough going on to raise it above the crowd and should make a nice clean contrast on any cheese board next to more pungent varieties. And as it seems to represent everything that's good about British produce, and is made in the North West of England to boot, I can recommend it wholeheartedly. Bootiful. First of all, a confession. I forgot to take a picture of the menu in the Landau, so my descriptions of the dishes in this review may be a little more vague than usual. 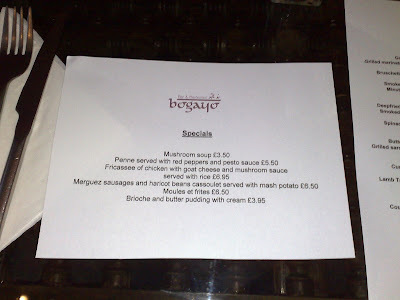 But in my defence, even if I did have the menu in front of me the chances of me making any sense of the surrealist masterpieces we ate yesterday lunchtime would have been very small indeed. This is the style of haute cuisine that is in many ways the exact opposite of the food served at Foliage - it's fussy where Foliage is precise, mystifying where Foliage is straightforward. But on its own terms the Landau is just as rewarding an experience - you just have to free your mind (and your wallet) and enjoy the dishes given to you, without even beginning to understand why. The first course of the six-course tasting menu was some sort of ceviche I think (sorry!) 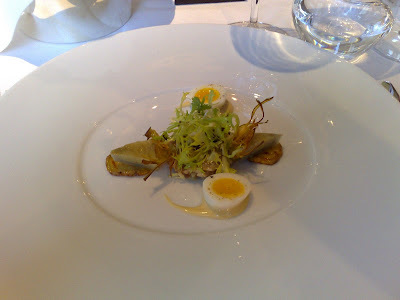 with soft boiled quails eggs and artichoke hearts. It was delicate and delicious with crispy vegetables adding texture and the ceviche itself being satisfyingly firm and tasty. Shot through all these ingredients was a heady note of black truffle, which also won points. A brilliant start. Next things started getting a little odd. 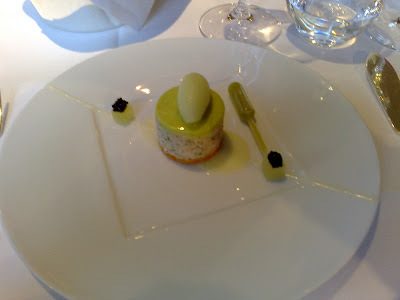 A little stack of parmesan cracker, fresh crab and apple sorbet was served next to two perfect little cubes of preserved apple flesh topped with caviar. Oh, and a pipette full of apple juice. We were instructed to squeeze the pipette into our mouths before starting on the other ingredients, which was more difficult than it sounds as if you don't tip your head far enough back the apple juice escapes down your chin. After mopping myself down with a napkin I attacked the crab, which was as fresh as you could hope for and mixed with avocado I think. The apple/caviar combo was delicious too, and overall this was another great course. 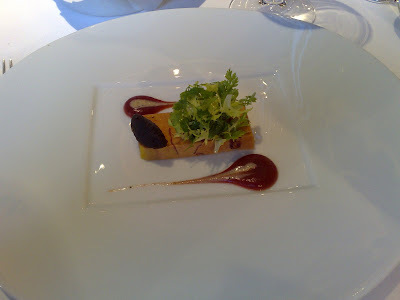 Sadly a fois gras terrine which followed let the side down slightly. The terrine itself was heavily laced with salty cured pork of some sort, which was a bit overwhelming. Also, almost as soon as this admittedly very well presented dish arrived on our tables a waiter ruined it by dumping a huge triangle of toasted brioche on top. 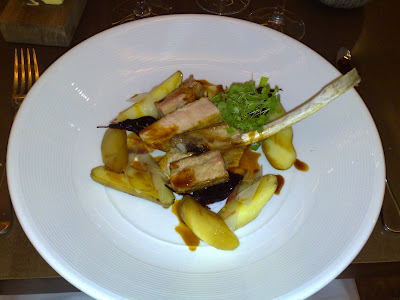 But it was only disappointing in the context of the first two brilliant courses, so we still wolfed it down happily. Then, in a change to the advertised item, a single fat scallop with a morel sauce, two teeny bits of leek and a smear of carrot puree. 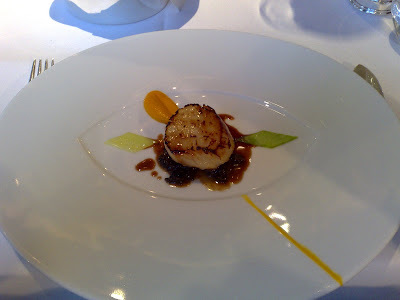 This was even more of a let-down - the scallop was lacking in flavour, as was the morel sauce which actually didn't taste of anything much at all let alone those famously strongly-flavoured fungi. The leeks were pointless, and the carrot was blah too. Perhaps the kitchen had struggled to come up with something decent after being let down by the sea-bass man. Not very succesful I'm afraid. Fortunately, the next course was absolutely stunning. 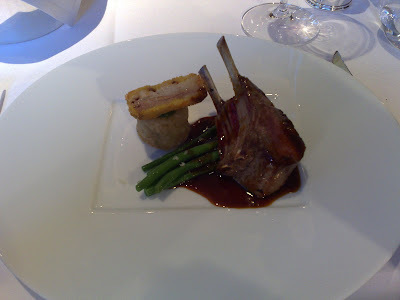 A great big two-rib rack of pink lamb served on perfectly cooked green beans and a gorgeous syrupy red-wine reduction. With it, a miniature mutton suet pudding (I think) was the real star of the show, earthy and meaty and packed with flavour. The lamb deserves a special mention however for being one of the best examples of this kind of meat I've had in a long while - for want of a better adjective, it was just incredibly "lamby". A really memorable course. 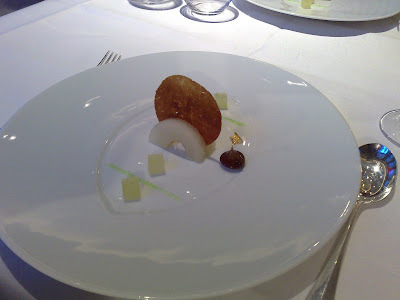 Finally, a dessert course which looked like it had been designed by Joan Miró - geometric slices of apple flesh with a "rising sun" caramel cracker. Next to it was a delicate teardrop of caramel containing a sweet appley liquid touched with gold leaf! Breathtaking to look at, and nearly as good to eat (there's only so much you can do with apple). 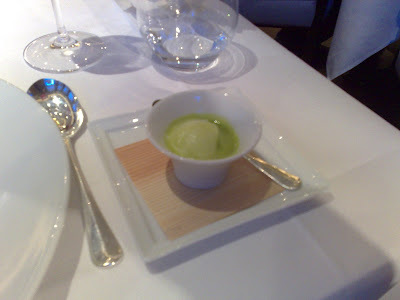 Served with it was a zingingly fresh apple sorbet. Service was as good as you would expect in any haute-cuisine London restaurant but a special mention should go to the Sommelier who was charming and approachable and matched the food with 6 expertly chosen half-glasses. But really everyone we came in contact with was professional and friendly, from front of house to the back. 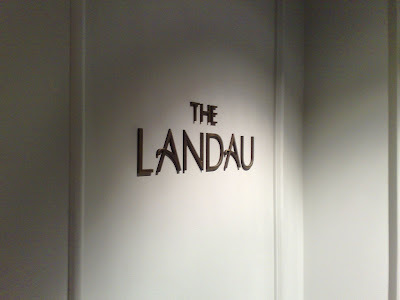 After a couple of terrible meals recently I was ready for a little pampering, and the Landau was a perfect tonic. The only major downside - predictably - became apparent with the arrival of the bill, my share alone being £130. Still, food of this standard rarely comes cheap and I don't feel it was out of kilter with other places in London of a similar level. 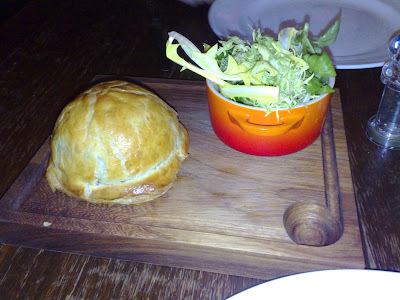 The Landau is an exciting new addition to starry dining in the city, and deserves to do very well indeed. I've said before that if you want a decent steak in London, the choices are pretty minimal. 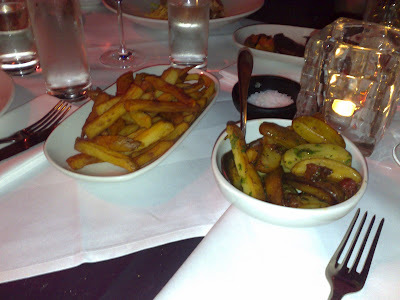 Some of the top hotels do a good, if often eye-wateringly expensive, steak frites and of course there is Hawksmoor which is by far and away your best option for the thickest and juiciest cuts of beef. I should hold my hands up at this point and say I've long held a deep prejudice against Gaucho Grills, partly thanks to word of mouth from fellow diners but mainly because the kind of activities I see inside the goldfish bowl that is the Broadgate Arena branch could be used to support a PhD thesis on the evils of capitalism. 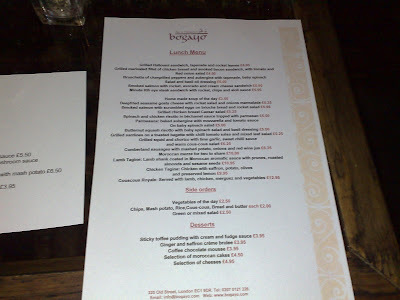 But a Saturday-evening trip to the Hampstead branch gave me the opportunity to largely validate my prejudices, thanks to an overpriced, shoddy and often downright bizarre meal. First of all, the service. I would suggest to any restaurant that if you make a big deal out of the fact you would like the table back within an hour and a half, it should be incumbent upon you to attempt to serve the food pretty speedily. But the half hour we waited between ordering and the main courses arriving suggested that perhaps they weren't that keen to get the table back after all. Also, I ordered a glass of house red from one waitress, while a friend was told they "didn't do house wines" by another. After I pointed out that I had, in fact, just successfully ordered a house red from a different member of staff, she scurried off and we both got our drinks. Second, the food. 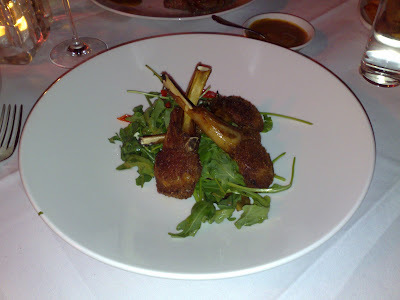 I tried lamb cutlets which were pointlessly breaded and deep-fried and tasted revolting - dripping with grease. 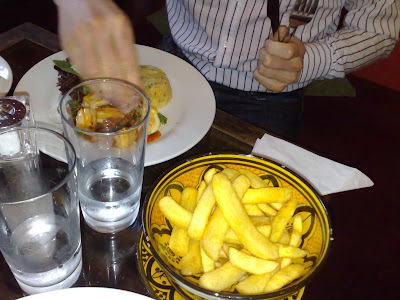 They were also served without any kind of sauce to balance the fat so getting through them was a long, miserable slog. 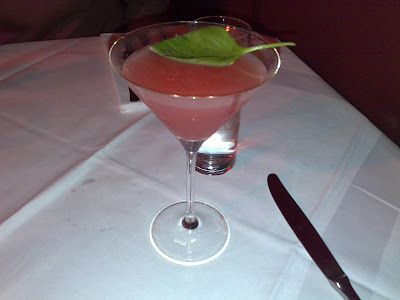 A house specialty martini with basil and grapefruit was only OK (quite warm), and the steaks served to my fellow diners ranged from tough and stringy to not bad. 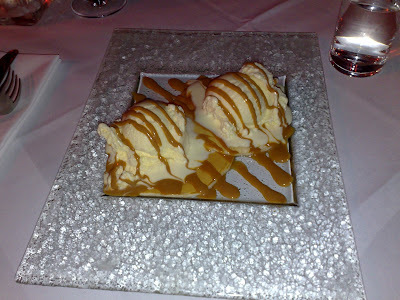 Desserts were hardly better, my two tiny pancakes being drowned under mounds of cheap half-melted vanilla ice-cream. Sides were expensive and boring, while those ordering steaks were forced to pay £1.50 per miniscule serving of peppercorn or bernaise sauces. A total ripoff. We thanked our lucky stars we were seated in the quieter tented section towards the back, as the noise in the main restaurant area was unbelievable, and the lighting bafflingly low. We felt our way through the cacophony back onto the wet Hampstead streets and wandered off to find a pub to drown our sorrows. It wasn't even cheap - £50 a head on average and not even close to being worth it. London does need more good steak restaurants - you can't expect people to either pay a fortune or travel to Shoreditch whenever they fancy a decent bit of meat. 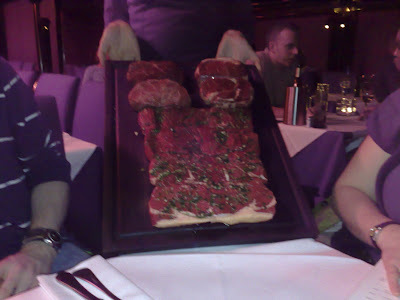 But I'm afraid I can't recommend Gaucho any more than I could the Angus Steakhouse in Leicester Square. And clearly, that's no recommendation. That's right! You guessed it - in a city tired of the same old fusion experiments, Bogayo is forging a brave path with its revolutionary "Italian-French-Belgian-English-Moroccan" menu. To hell with centuries of culinary traditions across Europe, clearly what London has been waiting for all these years is a restaurant that attempts one dish from every corner of Europe and cooks them all equally poorly. It's a menu that makes your heart sink just looking at it. What were they thinking? What kind of kitchen could possibly believe they could serve all these wildly different styles of cuisine to anything like an acceptable level? I should have made my excuses and left the moment its full horror was revealed to me, but with my adoring blog-reading public in mind (ha!) 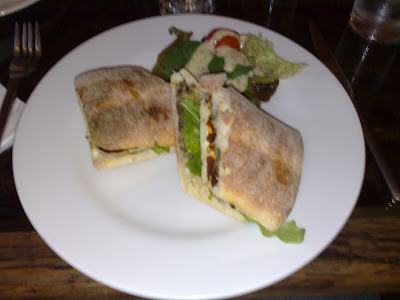 and With a due sense of extreme trepidation and dread I chose a halloumi sandwich and moules frites. The sandwich was dull as dishwater, the kind of thing any caff in the capital could rustle up in minutes, the salad coated in a dressing that tasted suspiciously like something out of a bottle - gloopy and sweet. Moules Frites, to be fair, weren't the worst in the world. 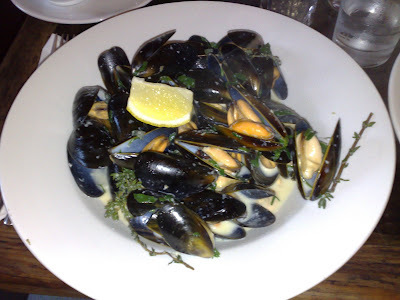 They weren't fresh mussels - obviously - but the sauce was light and herby and the chips although not frites (they were big fat ones) had a good texture. But they were just so uninspiring. A friend's squid and chorizo dish was incredibly sweet and cloying - not pleasant at all. I'm going to stop now because I'm determined not let the memory of Bogayo linger any longer than strictly necessary. It's a place so poorly conceived and serving such mediocre food I can't believe it's survived longer than a couple of days. But there it squats on Old Street, taking up valuable real-estate in an area of Shoreditch building an otherwise well-deserved reputation for gastronomic excellence (The Fox and The Princess are just round the corner). Do yourself and our great city a favour, and never ever go to Bogayo. 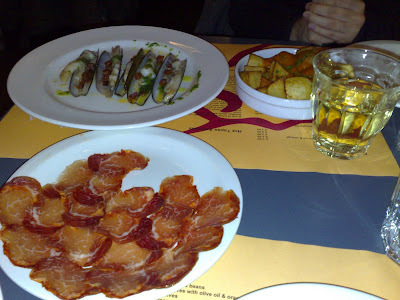 Brindisa Tapas, Borough Market. Finally! I wasn't going to make the same mistake twice. Half five on the dot last night I raced out of the office door, got straight into the Northern Line and made it into Brindisa Tapas by 6pm. Incredibly, most tables were already taken. This frantic activity is of course thanks to Brindisa's no reservations policy; perhaps it's easier for them to manage the tables this way, or they get a higher turnover. All I know is that personally I am less inclined to make the journey halfway across town if I think there's a good chance I'll be forced to wait for a table for two hours or made to look for somewhere else altogether. It doesn't make for a relaxing evening if you have that hanging over you, I don't think. That said, I suppose the fact I did, in fact, make the journey halfway across town last night sort of weakens my argument a bit. Anyway, what about the food. 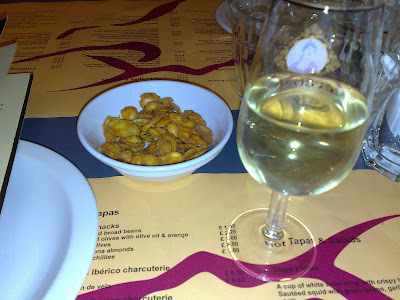 Nibbles of spicy toasted broad beans were gorgeous with the house Manzanilla. Gran Reserva Joeslito loin was a satisfyingly rich and earthy cut of cured pork which thankfully tasted as expensive as it actually was (£10). We also tried some razor clams which were teeny but came with fantastic rich white wine and garlic butter dotted with crispy bacon bits. 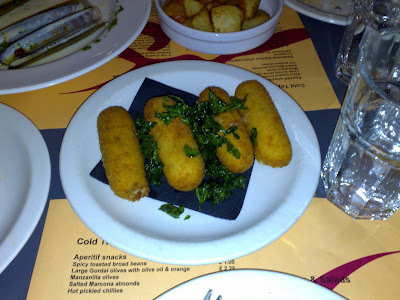 Patatas Bravas were well-cooked and the sauce was much spicier (and therefore better) than any I'd tried before, and four Iberian ham croquettas were fluffy and light with a crispy coating and were as good as any I've had outside Spain. So, no problems with the food then. And provided you do strike it lucky and get a table at Brindisa, service is nothing short of faultless - not surprising considering there are almost as many staff as customers in the tiny room, but even so worth a special mention. During the course of the evening I hardly needed to glance up from the table before I caught our waitress' eye, probably contributing to the fact I spent so much on sherry. So there is nothing wrong with Brindisa once you're inside, nothing at all - they serve great fresh tapas, sympathetically cooked according to Spanish traditions (apart from the preponderence of Catalan ingredients and dishes, tapas not really being a Catalan thing) and the service is worth every inch of the 12.5%, and then some. But the reason I don't think I'll be visiting Brindisa too often in the short-term is nothing to do with the food or service, it's because I can't guarantee that the effort of getting there will come good. 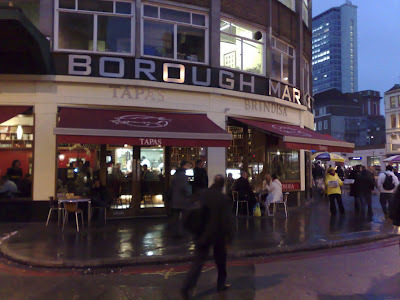 People tend to linger a while over tapas, and there are so few tables in this tiny corner of Borough Market that they are constantly hugely oversubscribed. My only hope is that it won't be long before Brindisa can afford to move to bigger premises and have a proper reservation process. Then I'll be back - again and again. I know this blog hasn't technically been going for a year just yet, but early January seemed an appropriate time to start thinking about those places over the last 11 months that have really stood out and deserve special recognition for the quality of the experience they offer. It's funny how with time and repeat visits you are able to put meals into perspective - good and bad - and I often have to stop myself going back and changing the odd rating here and there. 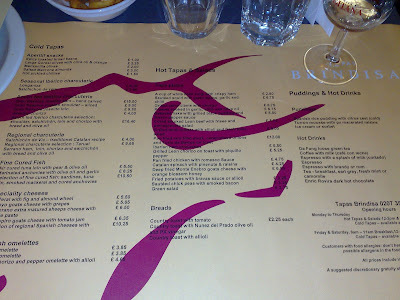 Tayyabs for example probably deserves even more than the 8/10 I gave it back in August just for sheer consistency on such a tiny budget, while my obsession with tapas before the novelty wore off probably boosted places like Barrafina's score to unjustified levels. I should not be paying £12 for someone to slice some ham and put it on a plate, I realise that now. 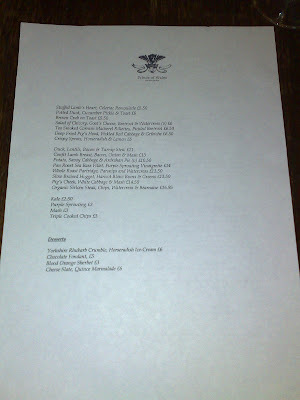 But while I'd like to say my best meal of the year was at some worthy low-key establishment serving hearty fare for next to nothing, I'm afraid if I'm really going to be honest most of the places I really rate tend towards the higher end of the market. 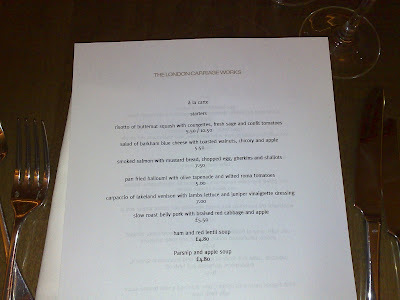 What can I say - I'm a bit of a sucker for luxury, and great food matched with the finest wines known to humanity served in great surroundings with faultless service, these are what make a truly memorable meal. Pearl was stunning, Galvin at Windows spectacular but the crowning glory of all the brilliant meals I've had this year was my birthday at Foliage in Knightsbridge. As I mentioned at the time, there is something truly special about the dishes we were served at Foliage - something honest and effortless yet at the same time touched with greatness. You get the impression that if you asked Chris Staines (head chef) to cook scrambled eggs for you, they'd be the best scrambled eggs you'd ever had. Or if you asked him to rustle up a fruit salad it would taste as if every item of exquisitely prepared fruit was mixed and arranged just for you. So often in aiming for the lofty heights of gastronomy kitchens bewilder and bemuse just as much as they surprise and delight. I know I liked my meal back at Bacchus in March but could I explain to you half of the weird and wonderful creations I ate that evening? No I couldn't, and there's something slightly alienating about that - I believe that a good portion of the enjoyment I receive from a plate of food is understanding at least some of what is going on with the flavours and textures. The food at Foliage is not "safe" by any means, but it is sincere. It flatters you. So congratulations Foliage, a deserving winner of best meal amongst very many good meals in 2007. And only a few days into January, things are already looking promising for the new year. I am currently first on the waiting list for the Fat Duck later on this month, so wish me luck for that, and you never know I may even strike it lucky with a reservation for El Bulli 2009 season. Closer to home, the London restaurant scene no signs of slowing down and despite the odd duff new opener it's still the case that confidence in British cooking has never been higher. I know many people have sneered at Gordon Ramsay's efforts to start a gastropub empire but think how great that would be - a Narrow in every London postcode! Honest British ingredients cooked competently and served informally, on your doorstep. Every Londoner should have a Fox and Hounds to call their own. Finally, thanks for all your comments over the past 11 months and to everyone for reading, particularly Jay Rayner who after he kindly mentioned me on the Guardian Food Blog managed to increase my readership elevenfold. Admittedly 11 times 1 is still only 11, but you've got to start somewhere. Here's to 2008, then, and wishing you all a very Happy New Year. There's no getting around the fact that outside London the restaurant scene in this country can be at the very least hit and miss. You can eat badly anywhere of course, it's just that you really start noticing the ratio of good to bad places dropping off dramatically the moment you leave the capital, and finding anywhere half decent in the regions requires a fair amount of research, a sprinking of good fortune and often a not insignificant budget. Liverpool is attempting to make things easier for the average food tourist by arranging all its good restaurants on one road - Hope Street - within minutes of each other, and with a farmer's market on the same stretch of tarmac on the third Sunday in every month. Worth checking out to anyone in this part of town are the Side Door (reviewed back in July), Ego, which is a small chain but is consistently decent and do lots of organic stuff, 60 Hope Street, a high-end bistro serving good local produce, and The London Carriage Works, which I visited on a bitterly cold evening last week. The first thing we were told on arriving was that nearly all the fish & seafood dishes were unavailable - probably something to do with the time of year, and at least they weren't using frozen substitutes. Service was friendly enough - surprisingly not always a given in a city famed for the warmth of its people - and with the main restaurant closed off the few diners in the brasserie/bar area were treated with commendable attention. 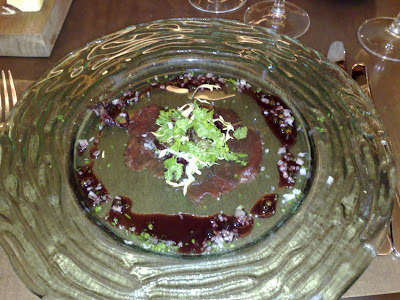 My starter was Lakeland venison carpaccio. I chose this because I like venison and despite the fact all meat carpaccios I've ever had have been rather disappointing, I was hoping that a strong gamey flavour would bring something new to what is all too often a few cold slices of tasteless meat on an oversized plate. Unfortunately the meat on this dish could still have been anything - there was no strong venison flavour and my opinion of carpaccio is still resolutely unchanged (ie. a pretentious waste of good meat). 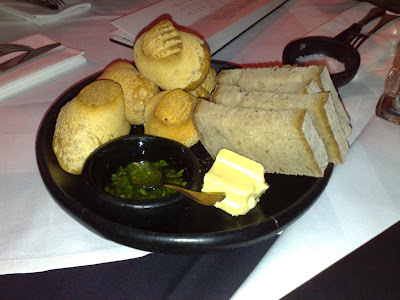 However it was served with a very nice peppercorn and juniper vinaigrette which went down very well mopped up with the excellent warm bread rolls. For main I had "Iron aged pork" - and despite being confidently informed by our waiter this meant "aged in iron barrels", I had my suspicions and indeed discovered that evening through the powers of Google that it is in fact a rare iron-age breed of pig from North Wales. This discovery was tinged with disappointment as I was ready to announce to the world a new Liverpool speciality of "pig in a barrel", which I think would lend itself quite nicely to an eccentric local food festival in the Gloucester cheese-rolling vein. Unfortunately the reality was far more mundane as the kitchen had seen fit to hugely overcook said pork, so much so that it was dry and chewy all the way through. A terrible mistake, as it is perfectly acceptable to leave good pork quite pink in the middle these days. I should say though that again despite the main ingredient being disappointing the jus and caramelised fruit and veg served with the pig were all brilliant. Such a shame. 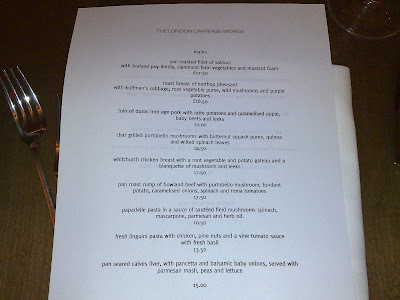 And there would have ended a pretty underwhelming meal, had the London Carriage Works not had one wonderful last trick up its sleeve - a cheese menu! 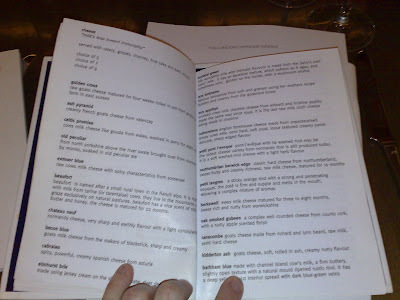 As I was salivating over the list of cheeses from all over the north west and the world it occurred to me - why don't more restaurants have a cheese menu? Plenty of top London places have cheese boards to die for (step forward Chez Bruce and Claridge's) but having to ask the waiter about each one in turn is exhausting. Why not have a proper list to consult? Apologies for the poor photo as I was attempting to hold the pages open with one hand and operate my cameraphone with the other, but take my word for it that the descriptions made very interesting reading and served as an excellent reminder that if there's one thing this part of the world does very well it's cheese. We chose Kidderton Ash and Smoked Gubbeen amongst others, but the real star and our latest greatest discovery is Mrs Kirkhams Lancashire cheese, waxy and soft with a lovely nutty taste and completely unlike any other Lancashire cheese I've ever tried. I'm told you can get it at Neal's Yard so I shall be going at the weekend. So full marks for the cheese course but "must try harder" when it comes to making the most of the admittedly well-chosen local ingredients. And at what is a premium price by any standards (best part of £50 a head) there's no excuse for overcooking pork. All is not lost - Liverpool has a few more restaurants on my to-do list so there's plenty of time to restore the reputation of the city, and maybe I shouldn't be so hard on a place which is doing a good job promoting local ingredients in a place not exactly famed for its gastronomic heritage. 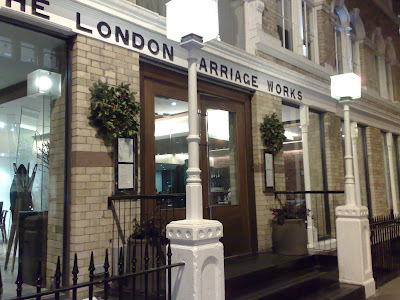 But equally I would be doing London Carriage Works an injustice if I didn't rate it by the measure of good food anywhere. There shouldn't be any such thing as "good for Liverpool".